Oakwood Lodge Park is open all year. Each Lodge being constructed of solid log and manufactured in Norway, all are equipped with full central heating, and just as well suited to winter holidays as they are to summer ones. 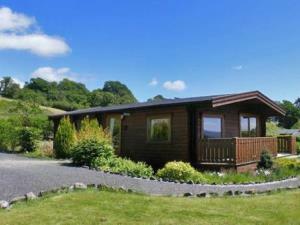 So whatever time of year you want to get away from it all, Oakwood Lodge Park is ideal, even over Christmas or New Year! You will find our Park is a quiet and peaceful one; many of the Lodges have private gardens offering seclusion and privacy. All Lodges have private Hot Tubs ideal for romantic breaks or to sooth away the aches and pains following one of the many outdoor activities available in the area. It is the perfect place to relax and unwind. Dogs are welcome at Oakwood, as they are in many of the local pubs. There is plenty of opportunity around the area for leisure pursuits including walking, pony trekking, mountain biking, fishing and golf. It is also an exceptional area for bird-watchers, the area being home to the red kite. Located right in the 'Heart of Wales', Oakwood is also an excellent touring centre, enabling you to visit any of the many attractions on offer throughout Wales. And with the ruggedness of the Elan Valley and Cambrian mountains right on the doorstep, what more could you ask for? 20 acres inc woodland paths and lawns for guest enjoyment. Children welcome from any age. To Rhayader on A470 --at centre of Rhayader turn onto the A44 towards 'Crossgates & Leominster'. On the outskirts of Rhayader, bear left onto country lane signposted 'Abbey-Cwm-Hir'. Proceed for approx. 2 miles, Oakwood Lodges on the left hand side. To Rhayader from east on A44 - turn right at outskirts of town signposted 'Abbey-Cwm-Hir'. Proceed as above. DO NOT TURN RIGHT AT THE FIRST SIGN WHICH IS 3 MILES OUT OF TOWN.